Are you looking to hire a 20 passenger mini bus to attend a birthday party? Do you want to enjoy the most comfortable luxury ride in Lakeland? Well, we have the right kind of charter bus rental Lakeland service that you are looking for. You will find our vehicles to offer you all the amenities and the thrills that you expect when traveling as a group. If you want more information call 813-514-6980 now! Whether you need to hire a 50 passenger charter bus or need shuttle bus transportation to attend corporate events or birthday parties we can accommodate your needs. With plush leather seats, hi-fi audio system with surround speakers, disco lights, LED lighting, mini bar and other amenities, we ensure that you have the most enjoyable experience inside buses. If you are looking to plan a trip and want to hire a 30 passenger shuttle bus from us, then you just need to fill in the details asked in the get a quote option. You will be asked to give details like number of passengers, date of travel, to and from destination, amenities needed, etc., and you will receive a quote within hours. We assure that we will offer you the best charter bus quote that you can come across online. The experience that you get when you ride in one of our charter buses is one that’s out of this world. You will want to stay inside our buses for most of the time because of the comfort and neatness you enjoy. 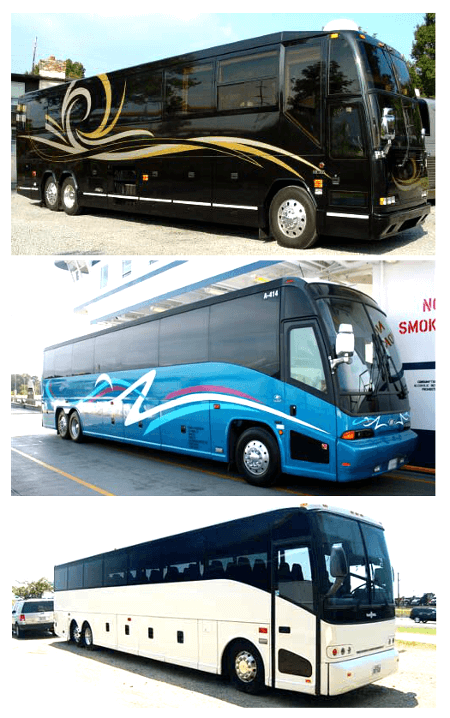 You do not have to look anywhere else for charter bus rental services. Get the best prices for bus rentals, call 813-514-6980. Want to kick your party into gear? Book our top rated Lakeland party bus for the time of your life! Polk Museum of Art; take our charter bus rental Lakeland service and enjoy the contemporary American and European decorative arts displayed here. Lake Hollingsworth; a 350 acre with beautiful lake that is also great for biking, jogging, fishing and walking. Explorations V Children’s Museum; three floors of exhibits, fun adventures and programs for kids to enjoy. Scarpa’s Italian; if you love to eat Italian food, then this is the place to be. Fantasy of Flight; this is a vintage and modern exhibition center for everything related to aviation. We offer you all kinds of charter buses to suit your airport transportation needs. Our charter bus rental Lakeland service will offer you smooth and hassle free transportation to and from Tampa International airport or Orlando International airport or St. Petersburg-Clearwater International airport in time. Lakeland limousines are also available to airport transportation. If you need charter bus Lakeland to visit some of the close by cities as a group, then we offer you affordable luxury transportation to cities like: Orlando, Saint Petersburg, Tampa, Bartow, Mango, Haines City, Plant City, Bloomingdale, Temple Terrace and Cypress Gardens.